The plot in section 7.3 has some problems. At the very least, the jittered values ought to be between 0 and 1, so the smoothed lines ﬁt better with them. Once again we use the data generated in section 7.2 as an example. For both SAS and R, we use conditioning (section 1.11.2) to make the jitter happen within the 0-1 range. In SAS, we use axis statements (section 5.3.8) to clean up the axis tick marks and labels. 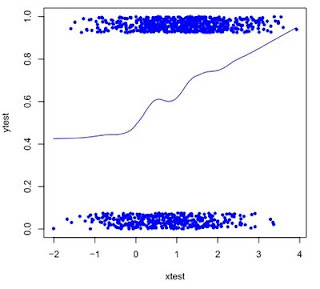 In R, we add a label to the y axis with the ylab option (section 5.3.8). We also modify the smoother to be a little less responsive to the data (by using a wider window, see section 5.2.6). 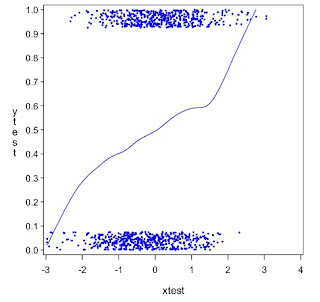 As with the uglier version shown in example 7.3, the differences between the two plots results from there being different randomly-generated data sets and because we use two different smoothers. In the next example, we'll show how to make a SAS Macro or an R function to replicate this plot easily. ggplot2 would do the jittered plot automatically with geom_jittered - no need to jitter the data manually.